After the first commissioner of baseball, Judge Kenesaw Landis died on November 25, 1944, a new one was needed. Leslie O’Connor was named as the interim commissioner until a permanent replacement could be named. Many felt the job would easily go to O’Connor. After all, he was an assistant for 24 years and was instrumental in all aspects of the game. A three-man council was appointed to name the replacement and after five months A.B. “Happy” Chandler was given the position. O’Connor stayed on for about a year to ease the transition. Prior to becoming commissioner of baseball, Chandler was a US Senator from Kentucky. Everyone expected the job to be a seven-year position but things didn’t go well. The one thing that got him in trouble was he was ready to integrate baseball and sided with Branch Rickey to put a black player in the major leagues. Chaos ensued. Many of the owners and general managers balked at this as they voted to not allow Jackie Robinson into baseball by a 15-0 vote. Another issue that got Chandler in hot water was his intolerance for gambling around the game. Yankees Larry MacPhail is to have had several known gamblers in the executive box during baseball games. Chandler went about putting an end to that. He suspended Leo Durocher for one year and fined the Yankees $2000 for the connection to gambling. All involved were ordered to remain silent and the true story never was made public. Players that jumped to the Mexican League were given a five-year ban from major league baseball which included Mickey Owen and Sal Maglie but it was lifted after three seasons. One progressive thing in Chandler’s wheelhouse was the restructuring of the pension fund for players and working on the first contract with the television industry. There are many characters of the baseball world and Rube Waddell was certainly one of them. To add to his legacy, he was born on Friday the 13th and died on April Fools day It was all the stuff between there that made Waddell a character. At 6’1″ and almost 2oo lbs., he was a great athletic specimen. It was said he had the mind of a child and the attention span of a four-year-old. He had a reputation for being a pitcher and was asked to come to a tryout hosted by manager Patsy Donovan. Before the first day, the team had breakfast and Waddell sat near Donovan After listening to the eccentric pitcher during breakfast, Donovan released him before he got to the field. The Louisville Colonels signed him in 1897. 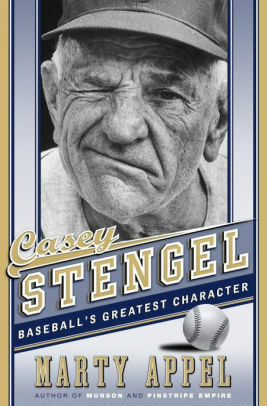 He was a fantastic pitcher with a blazing fastball and struck four times more batters than he walked. Batters had little success against him unless the team could find a way to break his concentration. That wasn’t difficult to do. It was reported that one team had a couple of puppies and kittens (smuggled) brought into the stadium and would have patrons hold them up at various times with Waddell on the mound. He would stop and stare at them and forget about batters and runners. He had an affinity for fires. He once heard a fire engine roaring by the stadium with all of its bells and sirens blaring and dropped his glove on the mound and followed it. He regularly assisted firefighters, from a bucket brigade in Pewaukee, Wisconsin to large departments in Philadelphia, Cleveland, Detroit, or Washington. During spring training (never during the regular season) he would instruct his infielders to stay in the dugout for the next half inning and he would strike out the side during games. Eventually, by 1902, he was a success and attendance in Philadelphia increased dramatically as fans wanted to see this character. He had cigars, liquor and other items named after him. In was the 1903 season that was traumatic for Waddell. He got married in June to a girl he met three days earlier. They never actually spent time together and she turned him into authority asking for and receiving support. The marriage, in name only, lasts for six years. In July, he was suspended and jailed for being up a spectator in the stands after being goaded by a gambler. During the offseason, Rube could be found trying his hand at traveling theater The production company used his name but never gave him much of a part in any of the shows. He was a frequent no-show and they had to tear up his contract. He would head to Florida in the winter and wrestle alligators for show. In 1905, he outdueled the great Cy Young in a 20 inning game. He reportedly used the game ball to barter for free drinks at saloons in his path. He would give the barkeep the ball for free drinks that night. He must have had hundreds of “so-called” game balls from that Cy Young game. Just before the World Series in 1905, Waddell claimed he had a sore shoulder and couldn’t pitch. His story is that he and another player argued over a straw hat and he injured his shoulder. Many believe that gamblers paid him to miss the World Series. 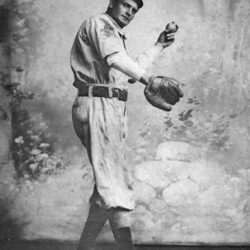 Things went downhill for Rube Waddell from there and he eventually moved from team to team with diminishing baseball skills. His health got poor after helping lay sandbags in Kentucky with an impending flood ready to destroy some towns. He contracted pneumonia and stayed ill for several months. He lost 60-70 pounds and couldn’t hold up as he contracted tuberculosis. He died on April 1, 1914, at the age of 37. This story begins on October 24, 1871, with the birth of Louis Sockalexis. He was a member of the Penobscot Indian tribe in Maine. He grew to be six feet tall and had a muscular build in which he would use to become a spectacular athlete in his youth. He was the best athlete among his peers and went on to play semipro baseball and that was when he got noticed. 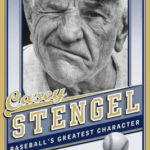 In 1894, he played baseball at Ricker Classical Institute in Maine and also played on various teams during the summer. One of his teammates, Mike Powers, convinced Louis to enroll at Holy Cross to play baseball. Sockalexis was a Catholic and a decent student and quickly was accepted. He proceeded to bat .436 in 1895 and .444 in 1896 for the Holy Cross team. Along with that, he was a star athlete on the first football team in 1896 where he excelled as the running back. In the spring, he ran track and many days he won as many as five first-place medals. However, it was baseball that he got the most notice playing. It has been reported a few professors measured one of Sockalexis’ throws and claim he tossed in 413 feet. The major league teams had a keen interest in him but the Cleveland Spiders had two players that had direct connections to Holy Cross athletics. In 1896, Sockalexis and Powers left school and enrolled at Notre Dame University in South Bend, Indiana. He last no more than three months before he was kicked out of school as they both got into a fight at a tavern over a girl and basically destroyed the place. With no college affiliation and no baseball, he signed with Cleveland in the winter and worked hard on training in the offseason to make the club in the Spring? He showed up in top shape and impressed manager Patsy Tebeau that he made the squad. One sportswriter was impressed with the Penobscot Indian player and referred to the team as “Tebeau’s Indians.” The name didn’t stick but it planted a seed for later in baseball history. Spring training was a time for Sockalexis to impress the baseball world. The Spiders played their first intrasquad game on April 2. 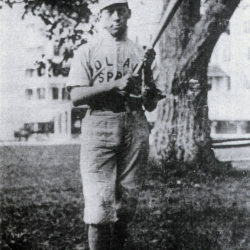 Tebeau divided the team into the “Indians” and the “Papooses,” and Sockalexis, batting cleanup for the Indians, drilled three hits, scored three runs, and threw a runner out at the plate from deep right field. He was a wonder. Things went well until early July when it was discovered Sockalexis has a huge problem with drinking alcohol in excess. That evening it is said he either jumped or was pushed out of a second floor window at a brothel that he frequented and promptly injured his ankle very badly. When he got back to the club, he was sent to a doctor that put a cast on it for almost a week. While his team was on the road, he was drinking every night a the local tavern. There are stories galore from here on out about how he lost his baseball skills as they eroded due to inebriation. He dropped fly balls, he couldn’t run the bases properly and now moved from team to team trying to hang on in baseball but to no avail. He left baseball in 1898 and went back to Maine to play on some local teams. He played in 94 major league games. Back in Maine, he tried to teach other children to play baseball even after taking a job in the logging industry cutting down trees. But at the age of 42, he suffered a heart attack and died. In 1915, team owner Charles Somers was looking for a new name for his team when he decided to revive the name that was given almost 20 years before and called it the Indians. UPDATE: All Book Reviews have been moved to our site, KnupSports HERE. It is my hope to read each of these books this year along with some new ones from 2018. I am fortunate enough to have two publishers that are sending me copies of books about to be released. I will add them as I finish the review. Check out our book reviews are KnupSports. I am always looking for sports books to read. If you have any to loan or give away, I would be pleased to read it.